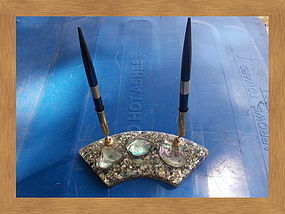 I am not sure of what the purpose of this box would be since it is a half moon and couldn't be for recipes or matches. Has the original label on the back. There are some light scratches to the surface and oxidation to the copper. 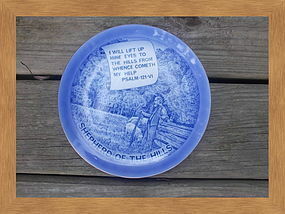 Vintage plate manufactured in Japan. It measures 8 1/4 inches in width. There are no chips, cracks or breaks. There is a tiny dot of loss of finish on rim, which looks like a manufacturer skip. The plate was photographed in natural light and shows glare to several areas, which is not to be mistaken as damage. 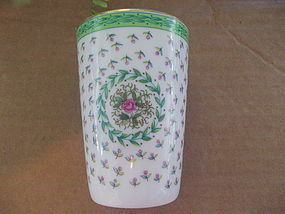 Covered mug with infuser marked as Elegance Goods Original. Very little sign of use. Enesco Japan stickers on both. Approximately 3 3/4 inches in height. They have a milk can shape. 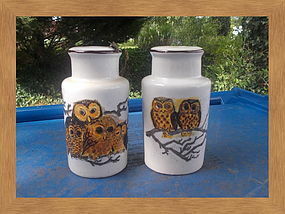 Do not appear to have been used and have original stoppers. 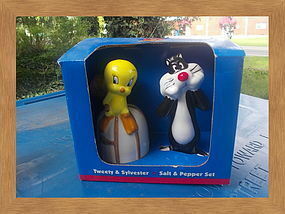 Looney Tunes Tweety and Sylvester ceramic salt and pepper shakers. They come in the original box dated 1998. There does not appear to be in damage, however, the box shows a bit of age related wear. They have not been removed from the box. Marked as Hull Oven-Proof. Little, if any sign of use. Part of the Hull Ridge series. Very little sign of use. 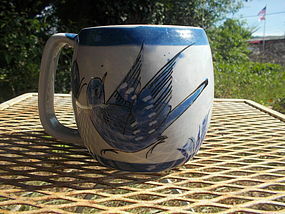 Seymour Mann mug marked as Evolution. 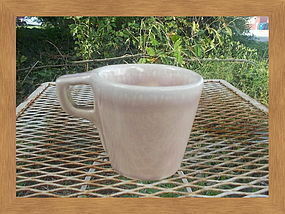 Appears to be a soup mug and holds approximately 14 ounces. Very little sign of use. 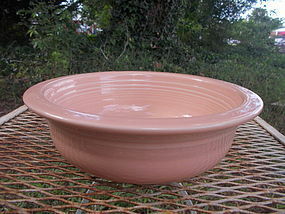 Vegetable bowl size. See picture #2 for backstamp for date identification. Very little sign of use. The gray is so dark that it looks charcoal colored. There is no damage. 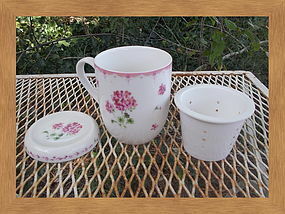 Two of these sets are available and priced individually. 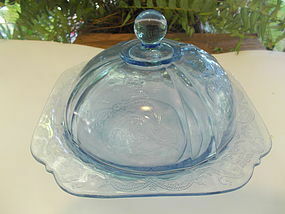 Indiana Glass blue covered butter dish. There is no sign of use. Marked as Tonala Mexico and a signature or logo that I am not able to identify, but will be glad to provide a photo. There is no damage. Lefton foil label (manufactured in Japan} as well as Lefton backstamp and 2009 identification #. Designed with portrait rose encircled with laurel wreath. The height is 4 inches. Minor wear to the gold trim. 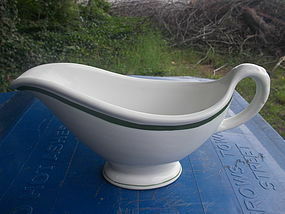 Gravy boat marked as Carr China 44. 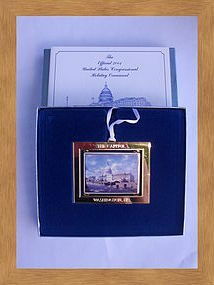 It measures approximately 9 inches in length and 4 1/2 inches in height. 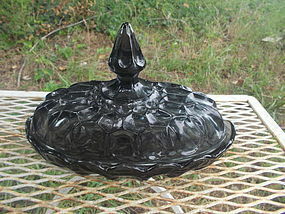 It is in wonderful condition for a 70 year old piece of china. There is no real sign of use (chips, cracks, breaks or marks). There is one tiny light dot of discoloration on the interior rim and the handle. I've tried different methods with my camera to show these areas, but they are so faint that with my poor photography skills, have not been able to capture them. 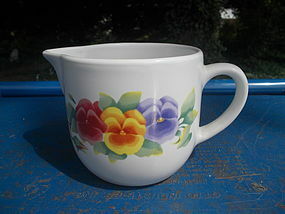 This is the heavy ceramic go-along creamer marked as Jay Imports. There is no damage. 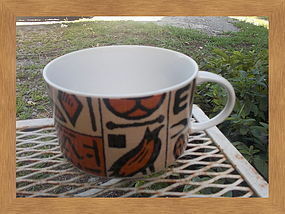 There are several other pieces in this particular style available for purchase.